METRO-NORTH'S FL9 LOCOMOTIVES have been operating for five decades! They were built by General Motors for the New Haven Railroad between 1957 and 1960 and can operate on either diesel or third rail power. They are unique with a two axle truck in the front and three in the back. They have four electric traction motors. The middle rear axle is not powered; it was added to distribute weight. The engines weigh 282,000lbs and have 1,800 horsepower. They provide 56,940 lbs. of tractive effort. Steam generators that once provided heat have been replaced with diesel generators that feed 480 volts to the train for lighting, heat and AC. ... Seven Metro-North FL9s (2040-2046) were updated with AC traction motors and a turbo-charged diesel plant that delivered 3,000 horsepower. Some of that power was used to supply 480 volts to the train for lighting and heat/ac. These units also have a feature called "regenerative dynamic braking." When the brakes were applied on the engine, the traction motors became generators. The power that was created was directed to a main source and used for lighting/AC. Excess power is routed to resistor grids where it becomes heat and is vented to the atmosphere by fans. All of the FL9-ACs have been retired and cut up for scrap. ... 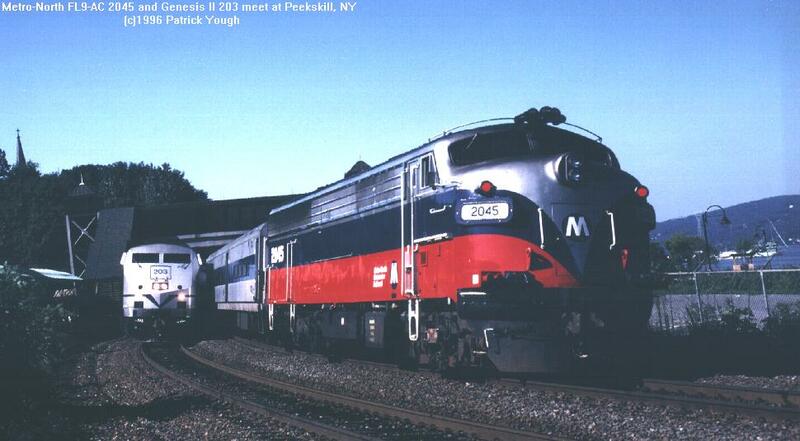 In 1995, Metro-North took delivery of five Genesis -II locomotives, built by General Electric in Erie, PA. Since 1995, Metro-North added thirteen more Genesis units. A final order of 13 more Genesis engines in 2001 hastened the retirement of the FL9s from long-haul service. They are still used on rare occasions for shuttle trains on the Waterbury and Danbury Branches and on the Upper Harlem Line and in work train service. The Genesis II locomotive, or P32AC-DM, has a twelve cylinder, four cycle diesel engine (the FL-9 has a two cycle diesel) that generates 3,200 horsepower. It is much different than the FL9, with computer displays, cruise control, and air conditioning in the cab. 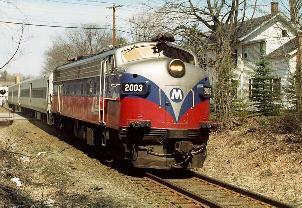 They have supplanted the FL9 as the primary passenger locomotive for Metro-North and Amtrak Empire Service trains. Unlike the FL9s, the Genesis units have provided reliable electric operation through Grand Central Terminal and the Park Avenue tunnel. The Metro-North units have enhanced electric capability that permits them to run in electric mode for an extended period of time. Jason R. DeCesare has a big photo page devoted to Metro-North, Amtrak, and LIRR FL9s.